Office buildings do not have to be drab, dull and uninspiring. Offices can also be architecturally and historically interesting, as news that two office buildings in Hampshire have recently been given Grade-II listed status shows. What’s more, the insides of office buildings don’t need to be boring. If you are setting up a new office or redesigning your current office premises, take a look at these tips for choosing and using office furniture. English Heritage bestowed Grade-II status on a pair of post-war offices, Mountbatten House, formerly known as the Gateway House, and IBM Pilot Head Office in Portsmouth. The roof gardens attached to Mountbatten House – known as the Hanging Gardens of Basingstoke – have also been recognised and classed as a historic garden. Foster Associates built the IBM Pilot Head Office, now known as Lynx House, in 1971 and Arup and Associates designed Mountbatten House. The designations came after English Heritage looked at commercial buildings built between 1964 and 1984. A further 12 UK office buildings have been added to the list. A spokesperson from English Heritage said that the offices demonstrated how architects have adapted to the changing way in which people work, including how open space was developed for individual working on PC monitors. The way we work should lead how offices are designed, but you don’t need to design an award-winning space in order to create a comfortable working environment. Before getting your credit card out, start by making a list of what furniture you need and what equipment you have or will buy. Include everything from the computers to filing cabinets and printers. Decide if you need extra space for more specialised tasks such as a large desk for displaying artwork, or a place for client meetings. Your location may already be set, if you are not moving premises. But you do need to work out where the windows and doors are, where the fire exits are placed, and the locations of the heavy pieces of equipment or items that cannot be moved. In most cases you should locate the desks facing the office entrance and with a light source in front of the table. Pick the furniture that best suits your needs – you want this to work for you, not against you. 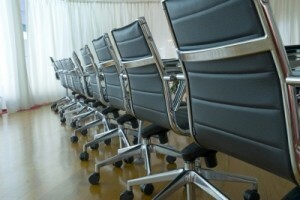 When buying office furniture Hampshire provides options in new, used, and auction items. It makes sense to spend more money on items like desks and chairs that affect the way you work, and can even cause health problems if they are not suitable for your needs. You can spend lesser amounts of money on shelving for store rooms, or filing cabinets. Make sure that furniture is highly functional – for example, a desk that has space for files, and a mechanism for keeping cables tidy and out of sight. Your furniture should also reflect your personal style – as we mentioned before, an office does not have to be dull. With the range of furniture on offer for offices, you don’t have to settle for plain beige tables and black chairs. Steel and glass create a modern, striking impression, while wood offers a more traditional feel.